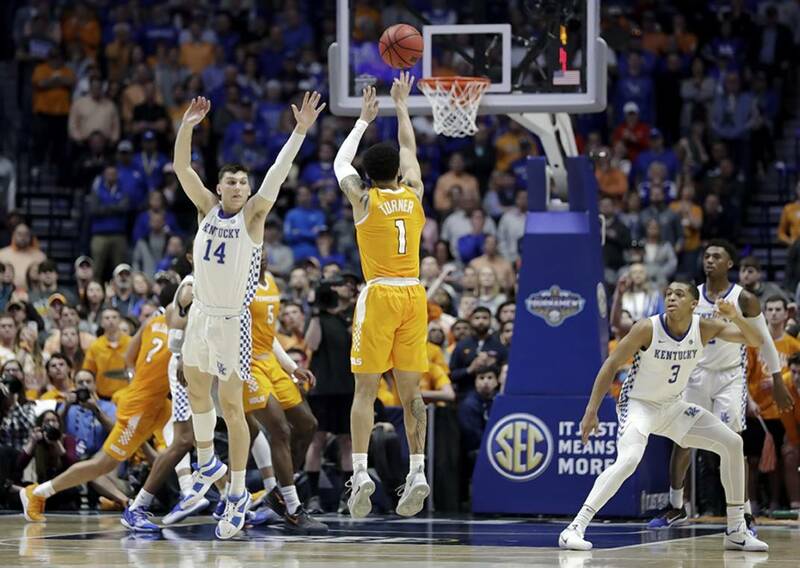 Tennessee guard Lamonte Turner shoots a 3-pointer to give the Vols a 78-76 lead in the final minute of their SEC tournament semifinal against Kentucky on Saturday in Nashville. Tennessee won 82-78 and advanced to the title game against Auburn, which beat Florida in the day's first semifinal. 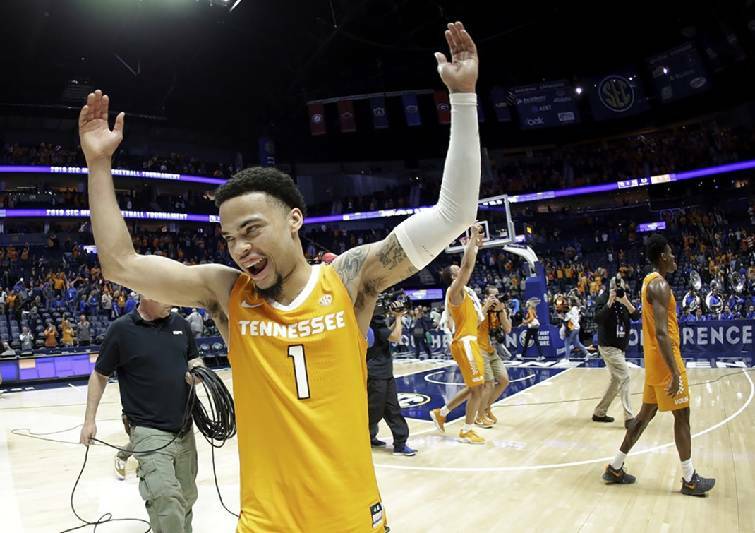 Tennessee guard Lamonte Turner celebrates the Vols' SEC tournament semifinal win against Kentucky on Saturday in Nashville. Tennessee's Admiral Schofield runs down the court in celebration after making a 3-pointer against Kentucky last Saturday in the SEC tournament semifinals. NASHVILLE — Throughout a slump that had lasted almost five games, Lamonte Turner maintained the same mentality: Shooters shoot. 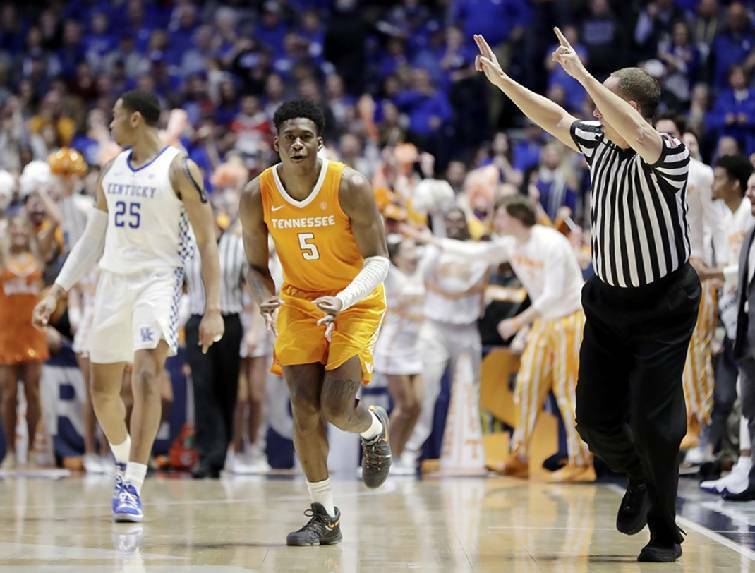 Tennessee's 6-foot-2 guard had made only eight of 32 shots in the four games leading up to Saturday's Southeastern Conference tournament semifinal against second-seeded Kentucky. The redshirt junior was 2-for-8 leading up to his final shot against the Wildcats, a 3-point attempt from the top of the key with 30 seconds remaining and the third-seeded Volunteers down a point. But shooters shoot, and with no hesitation, Turner shot the Vols into the championship game. He took a pass from Admiral Schofield and knocked down the go-ahead shot in the eighth-ranked Vols' 82-78 win, sending them into the SEC tournament final at 1 p.m. EDT Sunday against 22nd-ranked, fifth-seeded Auburn (25-9), a 65-62 winner over eighth-seeded Florida (19-15) in Saturday's first semifinal at Bridgestone Arena. Turner had missed 11 consecutive 3s prior to that made shot and admitted it had affected his confidence some. "I always know the next shot could go in," Turner said. "You can't really bank on the last shot or possession. In my career I've always had a short-term memory, because I know the game could go down to one shot at the end." Tennessee (29-4) outscored Kentucky 18-6 over the final 2:58, starting with a Grant Williams three-point play that halted a 4:46 stretch without a field goal for the Vols. That cut the fourth-ranked Wildcats' lead to 72-69, and Schofield, Williams and Turner followed with 3s, putting the Vols up 78-76. Kentucky's P.J. Washington missed a short left-handed runner, then a putback from point-blank range. The ball was knocked out to Tennessee's Jordan Bone, who was fouled. He made a pair of free throws, then another pair after an Ashton Hagans layup for the Wildcats (27-6). Schofield scored a game-high 21 points with 4-for-8 shooting from 3-point range. He added five assists, tied with point guard Bone for the team high. Williams had 20 points and seven rebounds, with 17 of his points coming in the second half. Bone scored 18. Jordan Bowden had nine points and five rebounds, while Turner finished with seven points. John Fulkerson had his second consecutive solid performance off the bench, with five points and a block, while Derrick Walker also played well in four minutes off the bench to help match Kentucky's physical aspect. There were nine tie scores and 15 lead changes Saturday, with four ties and eight lead changes in the second half alone. Tennessee took a 36-34 lead into the locker room, but the Wildcats went ahead 5:10 into the second half, 47-45, on an E.J. Montgomery jump shot. The Wildcats went on a 12-4 run midway through the half to build a five-point lead, then stretched it to eight during the Vols' cold streak. The Wildcats shot 63 percent in the second half and 54 percent for the game. They were led by Washington's 16 points. Keldon Johnson had 15, while Reid Travis — who missed the March 2 meeting in Knoxville due to an injury — had 11 points and six rebounds before fouling out. Hagans and Tyler Herro scored 10 points each, with Hagans adding 12 assists. The win gave the Vols the season series over Kentucky for the second consecutive year, although Tennessee lost in the SEC championship game a year ago in St. Louis. This season, Kentucky won big in Lexington and Tennessee won big in Knoxville, and Saturday the Vols got their second in-state victory over the Wildcats. Now Tennessee has a chance to win its first conference tournament championship since 1979. "We told our team before today, it wasn't going to be like Lexington, it wasn't going to be like Knoxville, it was going to be somewhere in between," Tennessee coach Rick Barnes said. "It was going to be a very close game, which it was. "Really proud of our guys. We were down eight with two-something to go, made some critical defensive stops. Offensively we went back to what we normally do — that is play inside-out. "It was a great effort all the way around. Just really obviously happy for our team."